One of the applications that was the focus of the emergence of a group of users, especially from users of Android phones and came this application to use the technology of enhanced reality and the provision of additional benefits to help developers to innovate. Move your phone around the space to find flat surfaces such as tabletops or the floor. Then drag a length tool or height tool into the scene, and adjust it to the right size. The application uses a wide range of sensors and sensors on the phone. The application only needs to install ARCore and access the camera, then move the phone to clear the surrounding area, and get a reference point that measures the lengths for it. 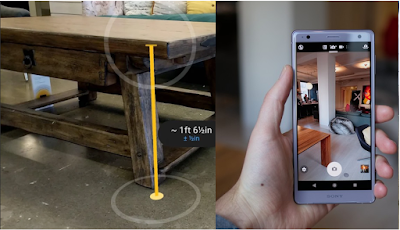 The application can be useful in some situations where the use of a measuring tape may be inappropriate, and it is available free and complete on the Play Store, or download it here.